Over Christmas I went away for three days. When I came back I couldn’t see three of my capsicum plants. They were flourishing when I left and I wondered what happened to them. They were in their crate next to a crate of heirloom cherry tomatoes called “yellow pear”. When I looked closer the capsicums were still there but hidden underneath the rambling branches of the yellow pear. Tomatoes are like bullies on the playground. They know no boundaries and seemingly have no manners. Just as I get annoyed with them and try to tie them back in their place, they show me bunches of plump, beautifully formed fruits as if to say, “See what I do?” “You can pick these in just a couple of more days” And, they are absolutely correct. I have enjoyed harvesting tomatoes twice a day for over a month. Some days there are six kilos of various kinds, three kilos in the morning and another three after the heat of the day. Tomatoes sacrifice looks for productivity. They are not vain. They are busy flowering and making fruit. Their season is short, for some, only four weeks from first to last fruit. As soon as the flowers are finished, the lower leaves are brown and dry. Tomatoes give their energy only to their fruit. On these brown and seemingly dead branches, there are plenty of plump and juicy tomatoes. They don’t like to get their leaves and fruits wet and want water only on their roots. After each rain tomato skin breaks and if ripe they tend to rot soon after the rain. Tomato harvest began in January when the days were long and hot. 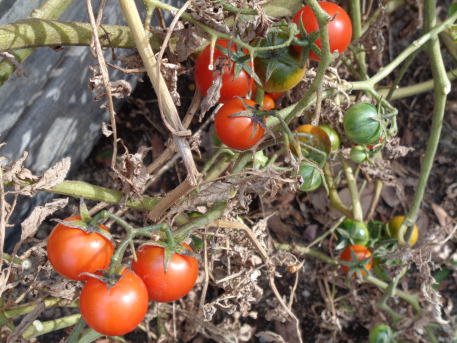 Now in March, autumn has arrived and tomato plants look worn out with their brown leaves and stems. There are still many tomatoes on them and only some will ripen. Others will stay green and will take on a new life as green tomato relish. This year’s harvest has given me much pleasure in sharing the abundance with friends and neighbors. I sold some to the local organic shop but the harvest was much more prolific than the rate of sales. The kitchen has been loaded with baskets after baskets of colours. There were Black Russians, Green Zebras, Tommy Toe, Cherry Sweet Bites, Yellow Pear, Grosse Lisse and Roma. We enjoy tomatoes with every meal and still have plenty of them left. Last weekend, with help from a dear friend, we bottled passata, stewed tomatoes and tomato sauce. My hope is to have homegrown tomatoes until next years’ crop. As I prepare myself to say goodbye to the last tomato, I glance over to the majestic eggplants and the regal capsicum. They are still in their prime and they call out to me to give them the attention once shared with the tomatoes. The main feature of this salad is the TOMATOES. Arrange the vegetables, sliced tomatoes and bocconcini or chevre on a platter. Sprinkle sliced basil on top. Mix balsamic vinegar and olive oil together and dress just before serving with a splash of salt and freshly ground black pepper. Allow the tomatoes to take a bow and a standing ovation. Delicious!!! Put everything in a food processor or blender and blitz for your preferred consistency. Some like it creamy and smooth… blitz longer. I like mine a bit chunky so I stop the motor sooner. Taste and add ingredients until it tastes the way you want it. Garnish with more chopped tomatoes or cucumber or sliced olives or all of the above. This recipe is gluten free, dairy free and paleo friendly. If you want to add bread to thicken the soup you can. Some serve it with grated parmesan as garnish. If you don’t like tomatoes, don’t worry. You can make gazpacho using stone fruits of any kind. You can add watermelon to any recipe for more liquid and texture. Gazpacho is very flexible and you can adapt it to taste. Mine never comes out the same twice. ENJOY!! !